Rosy Gold Bebe: Baby Food Fun! Penelope has been eating solids for a month & a couple weeks. I am thrilled that she is doing so amazingly well with it. She enjoys everything offered to her, except unsweetened applesauce. I make her food which is very enjoyable, fulfilling, super easy, & extremely cost efficient. I know she is getting great organic food without any additives. I began with rice cereal for the first few days & with much research began veggies promptly. There is SO much research out there stating rice cereal or oatmeal is truly not nutritious & only leads babies to desiring starches & carbs throughout life. With that in mind, I completely nixed that option & began with veggies for a week then adding fruit. I utilized a book called "Weaning" by Annabel Karmel. This book was a little helpful for a first time parent, as it gives some good basic recipes & insight into the weaning process. Although, I wanted more ideas & food options to truly get Pippa to enjoy more food throughout baby & childhood. 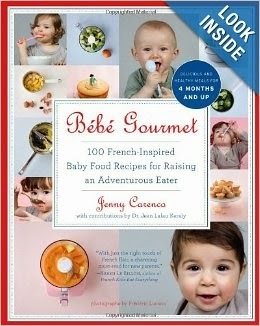 I ordered "Bebe Gourmet: 100 French Inspired Recipes for Raising an Adventurous Eater" by Jenny Carenco. This book is EVERY parent's must have!! This book gave way more insight into the weaning process, an amazing chart for what foods are appropriate at what age, a list of actual things you need in your kitchen or may already have, and truly amazing baby food recipes! Now, this is NOT a French Recipe book for babies. This a book that offers real, mature food options that even the family can enjoy, such as pasta dishes, fish options, dessert, & so on. This book's recipes seem to make eating enjoyable & nutritious for babies, as it is healthy eating, yet getting them used to different flavors & concoctions. I refuse to have my child only want chicken fingers, hot dogs, pizza, or mac 'n cheese. My hubby & I want to be able to take her out with us & share our meals with her, so in order for that to happen, she needs to enjoy a variety of food, soon on. Even the meals for the first couple months are different than any other baby food recipe I've found online, pinterest, or the "Weaning" book. So if you are like us at all, invest in this amazing book & utilize it. I am 100% confident you will be glad you did. I got my copy at amazon & am not endorsed to discuss this book. My copy of Weaning, I got through giggle.com Honest opinion, as always!